GAX30 [2004-2017], Other Shape Guitar from Ibanez in the GIO AX series. 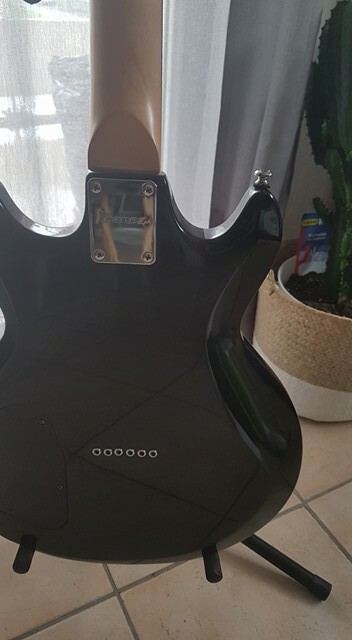 Product replaced by the Ibanez GAX30 [2018-Current]. I've been playing for a few years now. I've mostly focused on my acoustic, but just started playing more on my Ibanez. I listen to just about everything. As far as my electric, I have been playing more metal, like Sepultura and System of a Down. I wanted a starter guitar just to start practicing. I was trying to decide between a Silvertone and this Ibanez. Both were around the same price, but I chose this because the Silvertone was an off shoot and this is actually made by Ibanez, so you know you're getting the same quality. I haven't played many electrics so I don't have much to compare it to. I love the finish. I own the transparent red and it looks great. Ibanez definitely had quality in mind here. The neck is smooth and it's really eazy to play. The sound is better than I would have expected. The clean sound through my Roland Cube 15 is great, and it gets pretty crunchy when you flip the distortion up, especially on the "Metal Stack" setting on the Roland. I wish you could control the mid levels because some of the overdrives and lighter distortions get pretty unbalanced. I don't know if it's me, but the neck seems a bit heavy too heavy for the body. Sometimes it feels like you're holding it up more than actually playing it. Sometimes the tuners can be a bit tricky. They aren't as tight as my acoustic by any means. As I said before, I bought the Ibanez because I knew it was manufactured by Ibanez instead of being some knock of brand. The quality is definitely there in both the sound, look and feel of the guitar. The tone and volume knobs sometimes give off a little static when you move them, but nothing too bad. I think I've pretty much covered it. If you're interested in buying a good starter guitar at a great price without sacrificing quality, this would be it. If something were to happen to it, I would probably replace it with a GAX70, or something a little higher, but that's only because I've played it enough to know what I'd like to have in a new guitar. As far as new and beginning players, I would recommend it over any other comparably priced brand or model out there. I've ben playing since last christmas, mainly into Rock and Blues music, but I drift into Jazz Fusion, Metal and Funk. I play anything I think sounds good. I bought the guitar in Musician Inc. in Dublin for the small sum of 209. It was my first guitar so i didn't wand to splash out too much, butwhen I played this I just fell in love with it. This really is incredibly good value for a guitar. It is madefrom basswood, which gives areasonably good sound. The neckof the guitar is what attracted me to it the must, it s quite simply a thing of beauty. It isunpainted and unpolished and has a lovely sanded wood feel. Your hand just slidesup and down it so easily and it feels so good. Overall, it is a very solid guitar, I haven't had any problems with things coming loose at all and that with quite a bit of play. 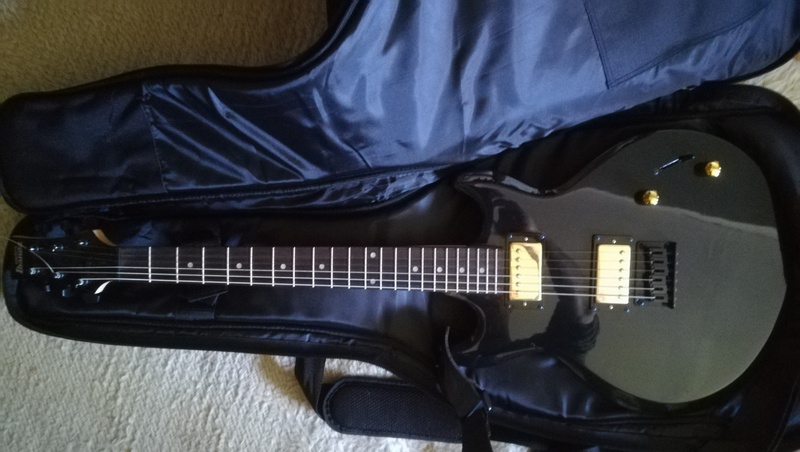 It comes with 2 humbucker pickups, which unlike some other guitars at this price range, they each have their only distinctive sound, one being quite chunky and the other i suppose more "stratty"
In all, this is a great practise guitar and perfect for any beginner. It is very cheap, but like all Ibanez guitars, it is quality. Bought online from Musical Instrument Warehouse in the UK. Paid £89.99, which may have been a sale price. Good sound, nice to play. The finish is fantastic. 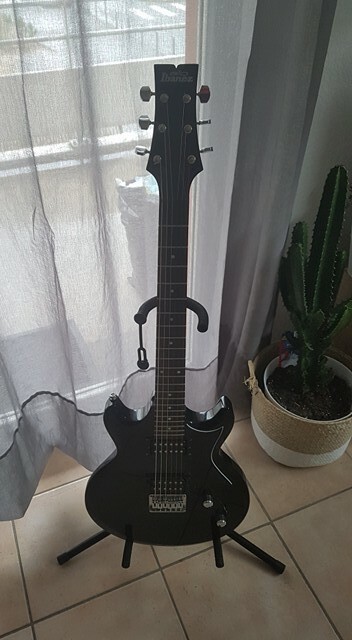 Before I received the guitar I was worried about the appearance because I'd only ever seen it on the Internet and those pictures (including on the Ibanez site)looked Photoshopped or something. Well, the colour of mine is transparent red, so you can see the wood grain. It is a gorgeous deep shiny red not the boring bright matt red you see in the pictures. I would imagine that the black and jewel blue versions are also impressive. If I have to find something to fault I would say that the tuning pegs look a bit cheap. Seems nicely made and good quality, certainly for the money. I'd have no hesitation in recommending this guitar to people. If you want a guitar for performing live I think you should play one of these and decide whether it's good enough for you or not. I got this Ibanez for Christmas at Lentines Music Store at Ohio in Montrose.I got it because its what alot of people reccomend. I like the bodywork and the color.Its Transparent Red.I like the design and how it has a nice clean sound.The chrome tuners are very good so no worries there.The humbuckers are very good and it has a 3-way switch.They stay in place very well.They don't fall off that easily. They could have made a better bridge but otherwise its a guitar that you'll love. 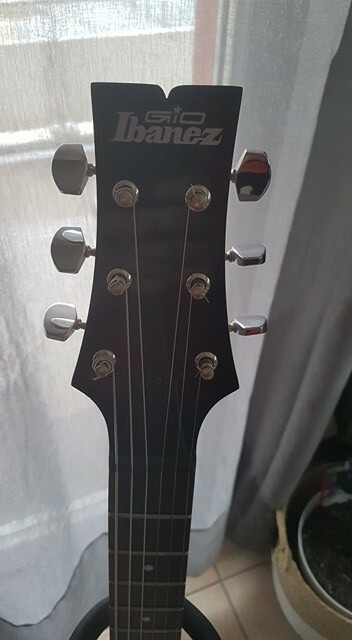 Well mines its Transparent Red and The tuners are chrome.The neck is made of maple wood.The headstock looks like a Gibson so you should like that!!! 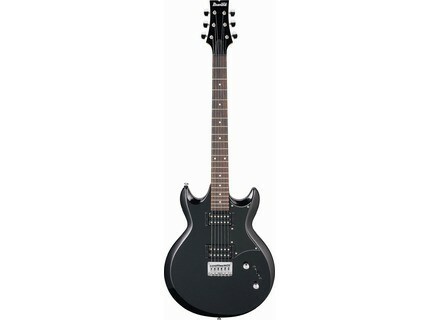 I'm a girl guitarist so you might think different from me.Its fantastic guitar for a beginner.Its good with any kind of music you wanna play with.From Classic To heavy metal it will work!!!!! !